Challenge yourself with the new invention of training fitness – rowing workouts. It strongly proves that a rowing machine plays an important role in improving your weight loss; enhancing cardiovascular system and muscle toning with low impact on back and joints. This explains why this type of machine becomes rapidly popular during current years. It has high suitability for users of all ages and physical health statuses. The most effective way to make you turn back to your rower more is finding the best rowing machine workout. It seems boring if we remain the same rowing workouts with the same resistance levels. Therefore, a question raised in our mind is how to keep the rowing motivation? The answer is so simple. Make your rowing machine workout fantastic by several changes in time or distance, strokes per minute and resistance level. The following rowing machine workouts come from the best tips of professionals in order to maximize your fitness targets. Keep on reading and find what you can get benefit from my suggested rowing workout plan. The rowing machine benefits vary greatly into different aspects. A big plus of the tool is that it puts a positive impact on all of your body parts, including weight loss, cardiovascular system, and muscle tones. 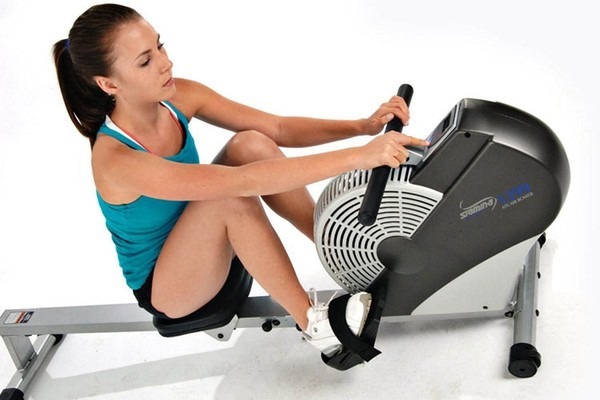 In comparison with other types of fitness equipment, exercising on a rower is considered to be a safe method with the low impact on legs and joints. One fact is that a rowing machine could burn up to 700 calories for the effective weight loss result. This great function comes from the requirement of all body part movements such as muscles in back, legs or arms. Moreover, regularly rowing on this machine could enhance your cardiovascular workouts in a comprehensive way. The best way to improve your lung, heart, and circulation is aerobic exercise. By applying this efficient training exercise, it helps provide enough sources of carbohydrates for improving your endurance. Remember to keep the suitable speed of resistance level for the best results. What is more? With the variety of requirements on different parts of your body, a rower requires the action of legs, hips, arms or legs. It is convenient that you could efficiently adjust suitable resistance levels for your needs. The higher resistance levels are, the more muscle tones you can get. In addition, huge improvement in mental health is another awesome factor that most manufacturers attempt to offer to users. Instead of spending time and money in gym classes or centers, you could purchase a rowing machine on your own. The machine is effectively used to enhance blood circulation for smooth mental health. Because of its excellent silence, you could watch TV programs or listen to music while exercising on the machine. These reasons explain why the rowing machine becomes one of the best purchasing options at present. 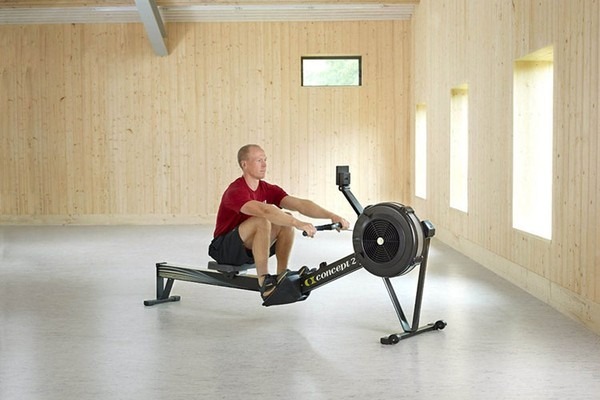 One of the first important requirements in effectively exercising on a rower is rowing machine technique. Applying the wrong techniques in your rowing workout may cause serious injuries and high impact on all of your body parts. As a result, you had a better focus on the right techniques before using this type of training. Legs are definitely considered as the main factor in burning calories on the rowing machine, while other parts including a back, core, and arms also helpfully contribute to this session. Then, acknowledge yourself about the way how to use a rowing machine. It is necessary to ensure that you are familiar with the structure of a rower before conducting a rowing machine workout plan. Top 3 essential parts for you to get acquainted include foot straps, damper setting, and the rower monitor. For instance, it is advisable for you to put your feet in the suitable place, not too high or low to avoid less efficiency and strokes. You will find it easy to make your feet comfortable by adjusting a few pegs. Next, damper setting will tell you how much air will be activated in the flywheel. There are numerous levels of resistance from 0 to 10 for different types of customers from low to high rowing skills. Beginners are recommended to choose 4 to 6 of resistance levels. Last, but actually not least, the rower monitor is an important part of clearly showing you detailed statistics related to your progress. Among different statistics, stroke rate and watts are 2 most out-standing information you had a better concern when looking at the monitor. It implies that there are not many difficulties in how to use a rowing machine. Get acquainted with this tool to enjoy a great number of gorgeous benefits. Let’s get started using the rowing machine by some slight warm-up exercises. These exercises don’t require too much effort. However, you will need breaking a bit of sweat before applying main indoor rowing workouts. To complete this task, you should pull the handle into your chest and keep your shoulders relax. Besides, combine well with the arm movements for stretching your feet. As a result, it will lead to the action of your back and legs. You continue pulling the handle into your chest, pushing legs and leaning back. Repeat this method within 10 minutes and move on the main rowing machine exercise. It is advisable for beginners to start rowing from the easy level. In this session, you should choose 750m and 1000m of rowing distance and keep the stroke between 26 and 32. If you feel familiar with the easiest pace, turn to the intermediate level with higher stroke. Choosing the program which is suitable for you the most is completely easy because all of statistics are on the monitor. All you need is moving your legs faster and faster. Exercising on the rowing machine within 20 minutes promises to bring up to 300 calories. Helpful guides from the world Olympic athletes promise to help you have an understandable view about rowing at all levels. Are you ready to apply the intermediate rowing workouts? The higher resistance levels, the more endurance you could enhance. All you need is maintaining good workout level and pace. With the higher resistance level, the rowing distance should be at 500 meters and you had better remain 32 to 36 strokes per minute. As a result, you could effectively burn up to 450 calories. Increase your resistance and speed as you feel comfortable on the rowing machine. This session requires you to make more effort through the fast movements of your legs. Both of the distance and strokes per minute are increased in an effective way. Spending 40 minutes on the rowing machine could release nearly 700 calories.